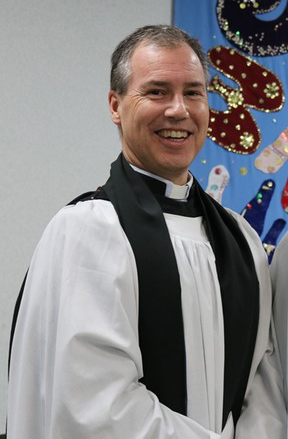 The Rev Jeremy Mould, curate of Belvoir Parish, Belfast, Diocese of Down and Dromore, has been appointed as Incumbent of the United Parish of Templepatrick and Donegore, Diocese of Connor. Jeremy, 56, is married to the Rev Jacqueline, with whom he has job shared the curacy in Belvoir for the last 16 years, and they have three sons and two grandchildren. Born in Africa, Jeremy grew up in High Wickham in England and studied History at Nottingham University. He first came to Northern Ireland to work as a volunteer with the Presbyterian Church’s Careforce (1985-1986). He moved to the Church of Ireland Youth Office from 1986-88 where he organised the first International Conference of Young Anglicans which took place in Belfast in 1988. Jeremy attended Church of Ireland Theological College in Dublin from 1988-91, and was ordained a curate for Mossley Parish, Connor Diocese, in 1981. He later served curacies in St Columba’s, Drumragh, Omagh (1994-96); and moved to the Diocese of Salisbury, England, from 1996-2000, where he was team curate in the Parish of St Andrew’s, Kinson, Bournemouth. Jeremy returned to Northern Ireland in 2000, first to co-lead Dungannon Community Church until 2003, and then to do a PGCE in Religious Education and History at Queen’s University in Belfast. From 2004-2005 he worked as an EOTAS Tutor for the SEELB, teaching entry level Maths, English and ICT to 12 excluded Year 12 pupils based in Lisburn College of Further Education. The following year he was a Volunteer Youth Worker at both Belvoir Parish and Omagh Community Church Drop-In Centre, before his appointment as job share curate in Belvoir Parish with his wife. “Jacqueline and I decided to job share because we wanted to have time for our three sons. We wanted to all be in the same church, and we wanted to enjoy our work,” Jeremy said. The couple’s youngest son is now doing his A Levels. “It has been a brilliant 16 years in Belvoir but the time is right to move on,” Jeremy said. “I am looking forward to meeting all the people in Templepatrick and Donegore and to working in these two beautiful churches. The service of institution will take place at 8pm on Thursday, 30th May 2019 in St. Patrick’s Parish Church, Templepatrick. Read more Diocese of Connor news on their website here.